Although not a new product, there has been a mini-surge of internet traffic reaching out to our fishing, fly fishing, and skiff outlets about mentions, reviews and advertising of a GPS tracker SPOT Gen 3. So, who gets lost the most? Someone finding a new fly shop 24 miles away from home in a car with a cell phone or a backpacking fly fisher on a 10-day canoe trek in the pristine waters of the Boundary Waters Canoe Area Wilderness in Minnesota? That is, of course, before it’s sold to foreign a mining company). Campers and small vessel adventurers like canoeists, kayakers, and bayboat fishers seem the most in the news reported in as imobile or lost. 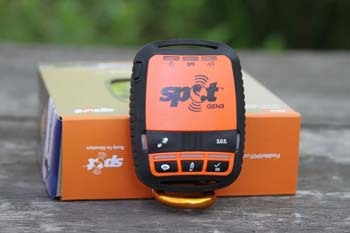 Here’s what one backpacker, Philip Werner, for the online magazine Section Hiker had to say about the Spot GPS system. We excerpted the story – Click on the link to read the complete SectionHiker review . . .
. . . Besides device usability, the main difference between the SPOT Gen 3 and the SPOT II is motion activated tracking and the ability to limit how often tracking updates are logged, be it on 2.5, 5, 10, 30, or 60 minute intervals. Both of these function preserve battery life, but who really needs them? Click on image to get prices for the Spot Gen 3 . I reckon backcountry skiers, helicopter pilots, adventure athletes and possibly guidebook authors are the people who would most likely benefit from the advanced tracking capabilities. But let’s face it, sending 10 minute location updates is only useful for entertainment, documentation, or body recovery purposes. 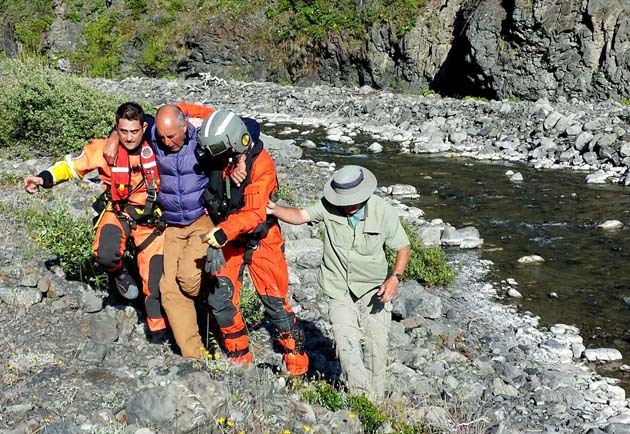 It serves little purpose from a backcountry safety or rescue perspective because there’s no such thing as instant rescue assistance in the backcountry – unlike urban EMS. Note: No one should expect a backcountry rescue to be called in if they’ve stopped moving for 10 minutes unless they specifically send an SOS message. Even then the rule of thumb is that it takes rescuers 1 hour to reach you for every 1/4 mile you are from a trail head. There is no substitute for self-sufficiency. I question whether people really need unlimited or extreme tracking. In addition to the new tracking capabilities, the battery life on the SPOT Gen 3 is over twice that of the SPOT II giving it the ability to transmit over 1,000 check-in or custom messages on a single set of batteries. But the SPOT Gen 3 requires 4 x AAA Lithium or NiMH rechargeable batteries or a 5v USB line connection, while the SPOT II requires 3 x AAA batteries and cannot be powered externally. One of the problems with the SPOT II was message reliability, particularly for tracking and check-in messages, where users reported delayed or lost messages which never arrived. It used to happen to me very frequently when the SPOT II first came onto the market, but much less so in recent years, which I think is probably due to improved satellite coverage or network reliability. Various reasons were given by SPOT for dropped messages including low battery power or that narrow canyons and tree cover blocks satellite message delivery. I was never really satisfied with those explanations because the device always reported successful transmission based on its flashing light feedback. In you’re in North America or Europe, SPOT claims that there is a “99% or better probability of successfully sending a single message in 20 minutes,” but when you start to pull that statement apart, it’s really not clear what it means or if it means anything except in the most ideal testing scenarios. A hike in for a five day outing at Mattole Beach Campground near Petrolia, California, went sideways. SPOT Gen 3 ad – image United States Coast Guard. I am excited to see the new usability improvements in the SPOT Gen 3. The device is much more idiot-proof and message reliability has improved noticeably. While I question the utility of the enhanced tracking capabilities available in this new version of the product, I’m a dedicated user of the OK check-in messages that you can send using the Spot Gen 3. I rely on this device to let my wife know that I’m ok in the backcountry and will continue to use it in the future. Pricing for SPOT Gen 3 – Amazon. . .